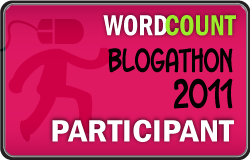 As part of my blogathon effort, I decided to ask a few friends if they would be willing to talk about why they blog--MORE than a few answered (thank you all!!! ), so this will be an ongoing, long-term part of my blog. I love reading their answers here. And so, with no further ado, I introduce you to Julie O'hara blogs at A Mingling of Tastes, where she develops recipes, takes lovely photos and shares it all. 1. What pushed you to food or wine blogging? About 4 years ago, I discovered food blogs and wanted to do my own. At the time, I really needed a creative outlet. It's led to a career as a recipe developer and freelance writer for magazines, so I'm glad I did. 2. What do you hope to share with readers through your blog? My definition of healthy food: it's GOOD food that's delicious and satisfying. But you also feel good about eating it. This recipe that I call "lemon lover's lemon bars" still gets comments and emails telling me how good it is. This is gratifying because I am always nervous about people liking my recipes. Plus, I created it to satisfy my craving for the ultimate lemon bar, and I love it! 4. Do you cook yourself? Well? What is your go-to dish (share the recipe in a few sentences? Something might be my go-to dish for months and then it will change and cycle back around eventually. Right now I think it's my take on shrimp and grits: Cook Quaker 5-minute grits with plenty of salt and pepper. Meanwhile saute a bunch of sliced green onions, garlic and a pint of halved grape tomatoes in a little olive oil. Then season some shrimp with salt, pepper and chile powder; saute in olive oil and add to veggies. Serve over grits and sprinkle with Feta cheese. It's also good if you stir some herb-flavor Boursin cheese into the grits when they're done (skip the Feta; or not). 5. Forget your favorite go-to dish; what is your idea of a perfect meal? As long as it involves really great red wine, and I'm eating with my husband, it can be a perfect meal. But probably some variation on steak with a pan sauce, a vegetable and popovers with butter on the side. This isn't really a secret, but it may be surprising: one shelf of my refrigerator consists mostly of candy. And generally not the fancy stuff. I'm talking about mini reese's peanut butter cups (the ones with dark chocolate are ridiculous); Hershey's miniatures; peanut butter twix; Reese's "Whips." I eat a little bit of candy (like around 100 calories worth) just about every day. Interesting interview! I'm always curious as to why food bloggers started chose to write about food. Those lemon bars look amazing!